A non-profit organizations means that their overall purpose is not to raise revenue, but to advocate a particular cause. Being a non-profit gives a large advantage when fundraising, as there is an overall consensus that the money is going towards a good cause. 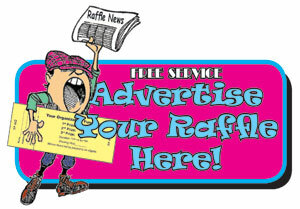 Raffle fundraising is an effective and easy way to fundraise for non-profit organizations. With the correct marketing, prizes, and meaningful cause raffle fundraising can become very profitable for non-profit organizations. In order to maximize the sales of their raffle tickets they should engage directly with the community. By working alongside profit-seeking business, such as grocery store, it can provide a win-win situation for both parties. The local business can provide an outlet for purchasing the raffle tickets, while in return receiving positive public relations with the community. If potential buyers know that the raffle tickets are being sold in a store that not only gets them in the door to purchase other items, but also shows that the store is willing to help the community for a meaningful cause. One way to encourage and stimulate ticket sales is to provide prizes that are exclusive; the winner cannot simply go to the store and buy the product. In addition to providing a product which value is much greater than the actual raffle ticket. As a starter of a non-profit it was eye opening to see how many business were willing and able to donate when provided with a cause. In particular, if the non-profit organization is a 501c, many of these company’s can write off their donations. By having the ability for companies to provide a relatively “free” product, this can allow for large companies to provide products that are of high interest to the consumer. Not only are these companies able to provide a product or service, it can also create positive press relations. When the prize greatly exceeds the price of the raffle ticket, this is when it stimulates consumer interest. For example items such as cars, luxury trips, and tickets to concerts are items that can boost ticket sales. Another way to increase profit, but still providing an exclusive gift, is to look more locally with prizes by providing unique opportunities, such as lunch with the major and taking a ride in your local police car. In particular politicians are looking for a way to get their name out there, this is a positive way to make their name familiar within the community. In order to maximize sales, there has to be dedication and motivation of the volunteers. This can be ensured through making sure the organizers and leaders of the non-profit organizations are clear on what they are fundraising for and where the money will be going. The money should be going towards a cause that the community and people are passionate about. By making sure the volunteers understand about where the money will be donated, this can ensure success. Raffle fundraising can create substantial revenue for non-profit organizations, which many cases they have no other way to raise profits. With the right cause, motivation, and implementation this can be a highly successful way to raise money, while also creating awareness of the cause.